In the Higgins archive are a few pieces of mourning jewellery related to the Higgins family. The most poignant and beautiful are two pieces in memory of Mary Ann Higgins, Cecil Higgins’s great aunt who died in 1829 when she was just 14. They are both made from gold and black enamel and engraved with Mary Ann’s name and the date of her death; the brooch contains a piece of her plaited hair under glass. I have always thought of mourning jewellery being the preserve of the Victorians, and though they certainly produced it on a mass scale, jewellery that remembered the dead had been made since the 17th Century when Memento Mori (literally ‘remember you must die’) jewellery was worn as a reminder of mortality. In the 18th century one of the most popular items of jewellery was the mourning ring, usually set with the deceased’s hair. One ring in the collection was made to remember Ellery Sydenham who died in May 1770 when she was just 10. A quick internet search brought up an Ellery Sydenham, buried at All Saints Church Dulverton in Somerset on 2 June 1770 aged 10, but I will need to do a bit more research to be sure if it is her. Like Mary Ann Higgins’s memorial brooch, the ring is also set with hair, this time surrounded by diamonds. The Sydenham ring was a donation to the collection, which is how the majority of jewellery has been acquired as Cecil Higgins did not leave very much in his original bequest. The largest donation of jewellery came from Mrs Hull Grundy, who gave over 120 pieces in the 1970s. We were not the only museum to benefit from her gift, with jewellery going to over 70 collections including the British Museum and the Fitzwilliam Museum. Bed-bound from her early twenties due to a respiratory condition, Mrs Hull Grundy bought much of her collection by post and, guided by the principal that ‘if you don't fall in love, don't buy it', she amassed a collection of thousands of exquisite pieces. It is from Hull Grundy that the majority of our Victorian mourning jewellery comes. The rituals of death became increasingly elaborate in the Victorian period mainly due to the example set by Queen Victoria after the death of Prince Albert in 1861. Mourning jewellery became mass produced, and whole industries were set up around the manufacture, particularly in Whitby where the most popular material for mourning jewellery, jet, was found. What’s interesting about some of the pieces in the Cecil Higgins Collection is that on first glance you wouldn’t think they were mourning jewellery at all. This includes pieces made from ivory carved to simulate wood, which are quite subtle in their depiction of remembrance. 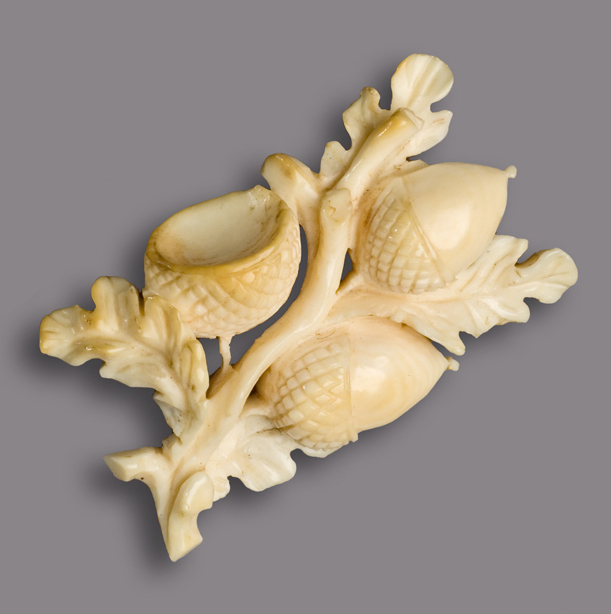 The brooch below, at first glance, looks merely decorative, but on closer examination you notice that one of the acorns is empty, which to the Victorians represented the inevitable end of love in death. Another piece from the Hull Grundy collection is also a bit confusing as to whether it was made for mourning or another occasion. Made from plaited hair with gold clasps, the bracelet is typical of Victorian hair-work which could either be made from the deceased’s hair, or with the maker's hair, when it would be exchanged at happier occasions such as engagements or weddings. These are just a few of the many beautiful pieces in the collection which we will be researching over the coming months, so there'll be plenty more to follow.